Think about that one block in your city that — if it just got a little bit of love — could turn into something really special. Maybe there are a few boarded up windows, or the streets have a few potholes that need to be filled. The houses are old, the schools nearby aren’t doing so hot, and it takes a little too long for the the fire department to show up when someone calls. Certainly your local government’s not spending a lot of money to help the residents out — either because they don’t have the budget, or because it's mostly going to your city's more affluent neighborhoods. But you recognize that in our communities, poor neighborhoods like these are often some of the most financially productive ones around — and in fact, they’re often providing the revenue that’s propping up the budget of a much nicer-looking rich neighborhood on the edge of town. What if this walkable, pre-war block with amazing bones and even more amazing residents could be be brought back, just a little bit? What if just a handful of vacant houses could be remade into clean, affordable units for tenants who could make them their homes? And if you have a little bit of money in the bank, you might be asking yourself: what if you bought one of those empty buildings yourself? Six months ago, that’s exactly what my partner and I decided to do in our hometown of St. Louis, MO. And the reason why it didn’t work out taught me something I never expected about why it’s so damn hard to bring a neighborhood out of decline. Like most of the people we know who decided to become landlords, my partner and I didn’t come to this idea overnight. We’ve both been passionate students of cities for years. Come over to our house for dinner and you’re likely to end up in a conversation about urban economics, affordable housing, transportation equity, or some other corner of the urbanist universe. But more to the point, by the time we decided to buy a house in a declining neighborhood, we’d been conducting a sort of ongoing self-inventory, constantly learning and talking and asking ourselves what we could do about the problems our community faces — and more importantly, what we could do well, and what we still needed to learn. We started small, buying a duplex in a slightly more established neighborhood and renting out the half we didn’t live in ourselves. After a couple of years of getting our feet wet as managers, we were feeling confident that we were up for the challenges of buying in a neighborhood that needed just a little bit more love. We’d been through a couple cycles of tenants and learned how to take good care of them on a sustainable, fair market rent, as well as how to deal with the seemingly infinite amount of surprises that come with buying one of St. Louis’ many 100+ year old buildings. Our ambitions weren’t great — our goal definitely wasn’t to get rich on any of this, or to single-handedly stabilize a failing street, or that we’d be some sort of heroes to our tenants. But we liked being landlords — and in particular, we liked landlording better than investing 100% of our money in nameless mutual funds when we knew our immediate community needed help. 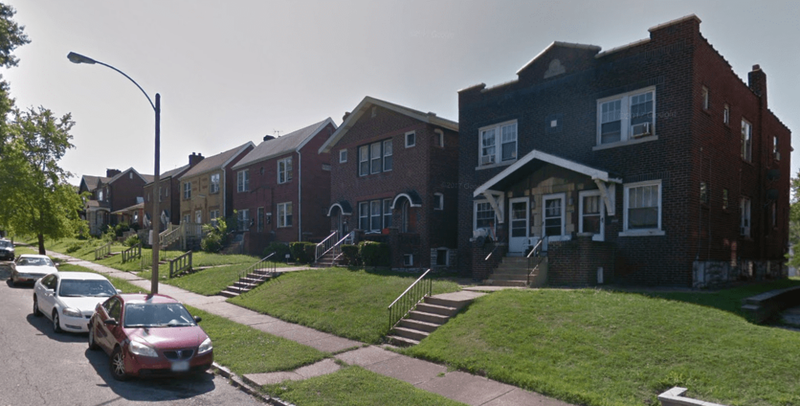 And so we had a choice: would we buy in a relatively established neighborhood like the one we live in now and, essentially, keep up the neighborhood’s status quo, or would we buy in a declining neighborhood and try to be a part of the change? We chose the latter. At least, that’s what we tried to do. I’ll call the block we chose B Street. If you’d like to picture it, think early 20th century brick buildings on postage stamp lots, kids playing ball in the narrow gangways between houses, adults chatting on stoops. B Street is a narrow one-way hemmed in by two mega-stroads that have separated the residents from affluent neighbors to the north and the south. Between the terrible road planning, a particularly rough go of the housing crisis, and a wave of heroin crime, much of the block has emptied out over the years, and what buildings are still occupied have struggled with overcrowding and absentee landlords. Like so many neighborhoods in St. Louis, B street has become a pocket of economic decline; there's simply no way around that truth. But good people live there. Particularly unique among St. Louis neighborhoods is the fact that the nearby International Institute had helped place a large number of refugee families on this street; if you stand on any back porch, you can see rows of beautiful, enormous home gardens planted by people who were farmers back in their native Congo or Nepal. If you can’t tell, we fell in love a little bit. And pretty soon, the CDC had an opportunity for us: a four family building with an asking price right around what we’d bought our duplex for a couple of years earlier. The building needed work; the CDC had bought it off an absentee landlord, and it was almost certain to fail an occupancy inspection, in addition to a litany of deferred maintenance items that would be virtual time bombs if they weren't addressed soon. But the CDC had already relocated the tenants to habitable buildings, and they were crafting a plan to fix up the apartments to make them truly livable again. If we could execute the needed repairs, they’d sell it to us at a very small profit that was just enough to cover their administrative costs; they just wanted to see good landlords in the neighborhood, and they trusted us. It seemed like a great deal. It was a great deal. All we needed was a bank. I should pause for a second and make something clear here: I am not a rich person, and neither is my partner. But let me also be clear about this: all things considered, we are lucky to be very financially healthy people. We both have great credit, no debt besides our current mortgage — he earned a full ride to college, I paid off my loans quickly, and we share a cheap, paid-off car — and we have experience buying and managing a multifamily property to boot. We had enough money in the bank to meet the down payment on the CDC’s asking price, steady jobs we didn't plan on leaving, and it has to be said that we are, demographically, extremely unlikely to be discriminated against by a lender. Realistically, there was no bank that would be likely to deny us a loan for this relatively small amount. If we could just get that last little bit up front to get the bigger repairs made, we’d be able to make this building something really special. Read Part 2 in this series to find out what happened next.